Transmittance explores collaboration which is local, global, networked and broadcast. 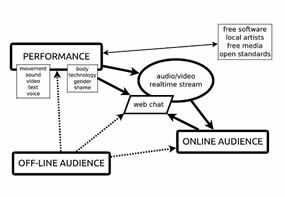 It involves an artistic group of performers, visual artists, musicians and computer programmers to research performative possibilities of streaming, broadcasting and telepresence forging new types of performance and audience. With focus on critical and socially-aware artistic languages this work is based on asking questions about body, self and society – opening non-dualistic perspectives. The project tries to rethink the notions of spectatorship and spectacle, ways of watching and seeing and the audience as spectators from the outside. In the framework of free telepresence technologies it is a quest to open new spaces of visibility for performance and new media art and while critically deconstruct also actively bypass power structures that have a hold on physical spaces of artistic representation. Emphasis is made on creative use of free and open source software and its impact on artistic process and collaboration. Transmittance is a project proposed by Maja Delak & Luka PrinÄiÄ.